Williams-Sonoma, Inc.’s WSM West Elm brand announced that it will inaugurate a new store in downtown, LA on Sep 20. The store marks West Elm’s fourth store in Los Angeles. The 11,221 sq. ft. store will sell locally-made products created by 22 California-based makers and artists. Apart from this, it will also offer a design consultation program, Design Crew, which will enable customers to seek design, installation and registry services from experts. Thus, such an initiative will drive its in-home, cross-brand sales and increase average order size. Moreover, in order to attract customers, the company introduced a gift offer, using which the first 300 shoppers will receive a special edition West Elm Downtown LA tote bag, on a minimum purchase of $50. It has been constantly adding new stores in a bid to drive sales. Additionally, the company’s consistent focus on product innovation, marketing and digitalization is a major growth driver for its overall top line. Williams-Sonoma is focused on enhancing customer experience through improved and innovative marketing techniques. In order to drive brand awareness, the company shifted its advertising spend toward social media campaigns, and cross-brand initiatives in order to increase customer engagement as well as tap cross-selling opportunities across its brands. In the second quarter of 2018, West Elm’s comparable brand revenues jumped 9.5%, with 6.1% year-over-year increase in net revenues amounting to $1,275.2 million. The company opened a total of 9 stores in the fiscal second quarter and added 4 more locations of Williams-Sonoma Home, bringing the total to 69 retail locations. The company has plans to open additional 4 stores in the fiscal third quarter, including a new store in its Rejuvenation brand, which continues to expand in the high-end lighting and hardware market and is on track to become a significant multichannel lifestyle brand. Driven by strong international presence, shares of WSM have surged 38.1% in the past year, outperforming the industry’s collective growth of 7%. 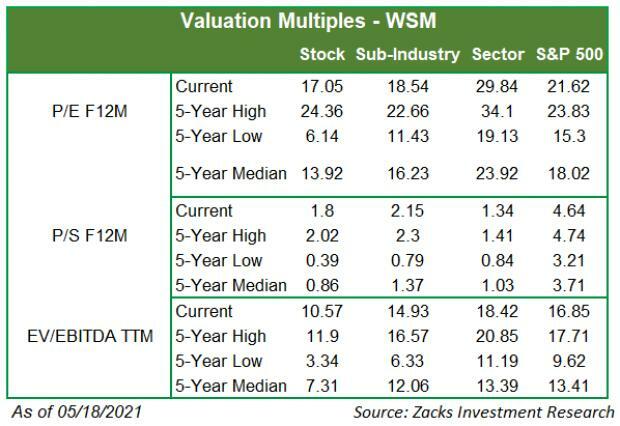 Williams-Sonoma currently carries a Zacks Rank #3 (Hold). Some better-ranked stocks in the Retail-Wholesale sector are BJ's Restaurants, Inc. BJRI, Darden Restaurants, Inc. DRI and Amazon.com, Inc. AMZN. While BJ’s Restaurants sports a Zacks Rank #1 (Strong Buy), both Darden Restaurants and Amazon.com carry a Zacks Rank #2 (Buy). You can see the complete list of today’s Zacks #1 Rank stocks here. BJ's Restaurants has an expected earnings growth rate of 50.4% for the current year. Darden’s expected fiscal 2019 earnings growth rate is 14.4%.